(a) Biomimetic carbohydrate recognition. In recent years we have reported a number of molecules capable of binding “all-equatorial” carbohydrates (glucose, cellobiose etc.) in aqueous solution.1 This work has culminated in a bicyclic cage which shows extraordinary affinity and selectivity for glucose itself.2 Now that the glucose problem is effectively solved, we should turn our attention to other carbohydrates, especially those with axial substituents. We believe there are certain modifications to 1 that should be readily achievable, and are likely to redirect selectivity towards non-all-equatorial substrates. If we succeed, we will have shown that biomimetic carbohydrate recognition can be a general phenomenon and is not limited to particular targets addressable through good fortune. (b) Systems capable of informational self-replication. The origin of life is one of the major unsolved scientific problems. It is clear that present-day life results from Darwinian evolution. 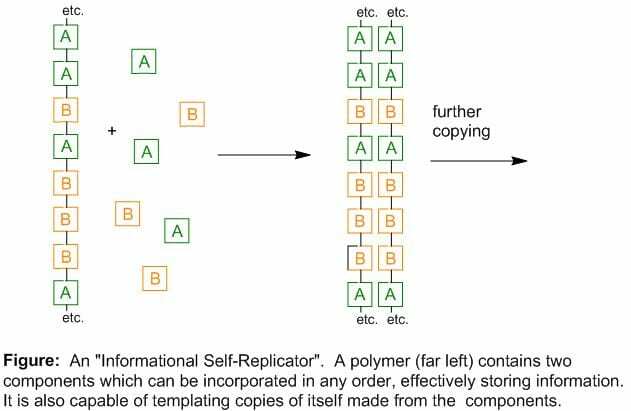 However, evolution requires species (presumably molecules) capable of “informational self-replication” (ISR) – they exist in many different forms (i.e. contain information), and each of these can reproduce itself (see Figure below). Nucleic acids (DNA and RNA) can do this under certain conditions, but we have no other examples. Moreover there are good reasons to think that nucleic acids were not the first informational self-replicators. Firstly, they are complicated molecules, and it’s hard to imagine that they could appear spontaneously from a messy mixture of prebiotic chemicals. Secondly, when a nucleic acid copies itself, it does so by forming a two-stranded double-helical structure. The new strand is bound strongly to the original, so that further copying is inhibited. We suspect that there must have been an earlier, simpler set of ISR molecules capable of operating in the messy prebiotic environment and beginning the process of evolution. Specifically, we believe that certain peptides might be able to self-associate and catalyse their own reproduction while coding and transferring information. This project involves the exploration of models of this process, and would be especially suitable for a candidate with experience in peptide chemistry. (c) Host-guest pairs capable of strong and selective binding in water. Pairs of molecules which bind selectively and strongly are used widely as “biomolecular glues”, binding biomolecules to surfaces or each other for analytical or diagnostic applications. The classic examples involve proteins, avidin and streptavidin, which bind extremely strongly to the coenzyme biotin. It could be very useful to have alternatives which avoid the disadvantages of protein-based systems (size, immunogenicity etc.) and/or could be used as complementary tools. Recently, in a collaboration with Prof. Bradley D. Smith of the University of Notre Dame, we discovered that our water-soluble receptor 2 binds the squaraine dye 3 with remarkably high (nanomolar) affinity.4 The system has potential for application as it stands, but would be much more useful if we could increase the affinity further (avidin-biotin is 106 times stronger) and optimise certain other properties. Meanwhile we can see ways of designing other binding pairs which could prove even stronger while being orthogonal to 2+3 (i.e. capable of operating independently in a mixture). If these can be realised, we can provide a set of tools enabling fundamentally new types of biomolecular self-assembly. See for example “A synthetic lectin analog for biomimetic disaccharide recognition”, Y. Ferrand, M. P. Crump, and A. P. Davis, Science, 2007, 318, 619-622. “A simple and accessible synthetic lectin for glucose recognition and sensing”, C. Ke, H. Destecroix, M. P. Crump, A. P. Davis, Nature Chem. 2012, 4, 718-723. 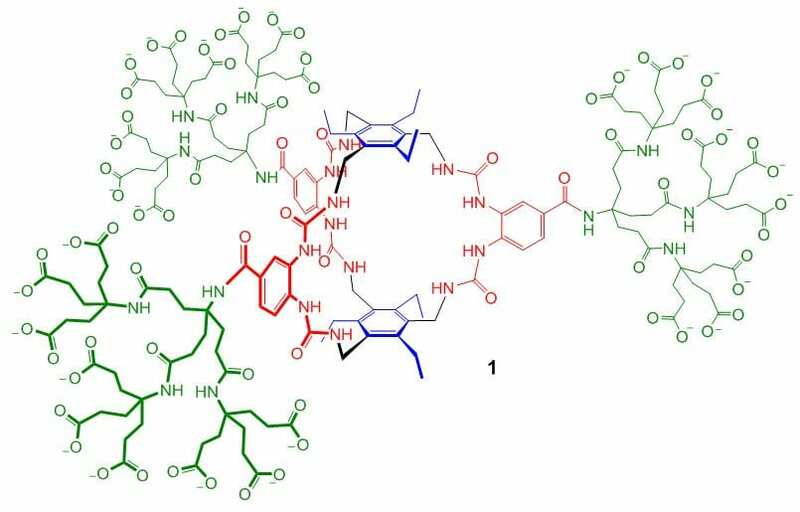 A threading receptor for polysaccharides. T. J. Mooibroek, J. M. Casas-Solvas, R. L. Harniman, C. M. Renney, T. S. Carter, M. P. Crump, A. P. Davis, Nature Chem. 2016, 8, 69-74. A biomimetic receptor for glucose. R. A. Tromans, T. S. Carter, L. Chabanne, M. P. Crump, H. Li, J. V. Matlock, M. G. Orchard, A. P. Davis, Nature Chem. 2019, 11, 52-56. Chiral encoding may provide a simple solution to the origin of life. A. Brewer, A. P. Davis, Nature Chem. 2014, 6, 569-574. Rapid Macrocycle Threading by a Fluorescent Dye-Polymer Conjugate in Water with Nanomolar Affinity. E. M. Peck, W. Liu, G. T. Spence, S. K. Shaw, A. P. Davis, H. Destecroix, B. D. Smith, J. Am. Chem. Soc. 2015, 137, 8668-8671. Applicants must have obtained, or be about to obtain, a First or Upper Second Class UK first degree, or the equivalent qualifications gained outside the UK, in an appropriate area of science or technology. To make a formal application, follow the ’Start a new application’ link on this page: http://www.bristol.ac.uk/study/postgraduate/apply/. Please select Chemistry (PhD) on the Programme Choice page. You will be prompted to enter details of the studentship in the Funding and Research Details sections of the form. We encourage you to make an informal enquiry to Prof Davis (Anthony.Davis@bristol.ac.uk) if you have any queries or would like to discuss projects. A full studentship will cover UK/EU tuition fees, a training support fee and a stipend (£14,777 p.a. for 2018/19, updated each year) for 3 years and 6 months. Applicants who are classed as Overseas for tuition fee purposes may be considered if they can supply the difference between UK/EU and Overseas fees.